Introduction and why we need Angular. Lab 9:- Making HTTP calls. Lab 10:- Input, Output and emitters. Lab 11:- Lazy loading using dynamic routes. In this Lab we will look in how to use jQuery with Angular. 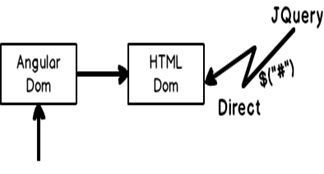 jQuery manipulates HTML DOM directly using "$" syntaxes while Angular creates a sugar-coated DOM over HTML DOM and does the manipulation via this sugar-coated DOM. So jQuery can manipulate HTML DOM without Angular not having knowledge about this manipulation creating more confusion. But then there are instances when we would like to use jQuery UI components like jQuery grids, jQuery calendar and so on which probably are not available in Angular. ★ If Angular is your prime framework then first see that you get your solution inside Angular if not then use jQuery or any other framework. In this lab we will use jQuery to fade away and fade in our grid component. So let’s create a button with name Hide grid. When the end user clicks on hide grid the grid should gradually become visible and invisible. So the first step is to get jQuery. Let’s fire up the node command and also let’s get jQuery as well as lets save the entry in to "package.json" file. On other side typescript is strongly typed. Everything is done during design time / compile time, typescript has to know the methods, parameters everything upfront. So to get the jQuery typing’s we need to do npm install by pointing at "@types/jquery". In fact you can load any types by using "@types" for example if you want to load lodash you can do "npm install" on "@types/lodash". jQuery references HTML UI elements using selectors. In selectors, we need to provide name or ids by which we can get reference of that HTML element. So let’s wrap our "grid" component inside a DIV tag and lets assign some "id" value to it , like the one we have given in the below code "divgrid". Also we have created a button which calls the "Fade" methods from the component. Now the first things is to import jQuery in to your component file. For that we need to use the below code. You can see the import statement is bit differently used. We are using "*" and "as" keyword. "*" means we want to refer full JQuery file and "$" is the alias by which we will be referring jQuery syntax in the code. Once jQuery has been imported we can now use "$" to execute jQuery syntaxes. You can see we have created a method called as "Fade" in which we are referring the HTML DIV ID and calling the "fadeToggle" method to fade in and out. Our JS files are loaded using SystemJS module loader. So we need to make an entry in to "Systemjs.config.js" file stating where the jQuery file is located. If you see we have specified the folder path as "dist". "dist" stands for distribution folder. The final compiled copy of jQuery is in this folder so we have specified the same. Now run the program and see the output. If you click on the "Hide" button you should see the grid fading out and in.